The Gold Coin Balance is a simple tool for testing seven different one ounce gold coins: The Philharmonic, The American Eagle, The Krugerrand, The Canadian Maple, The Kangaroo, The Panda and the Buffalo. The Balance is designed so anyone can easily check the diameter, thickness and weight of a coin to determine if it is real gold or a counterfeit. The Gold Coin Balance is the simplest, least expensive and most reliable way to test these seven, most widely available, one ounce gold coins that represent 85% of the market sales of gold coins. In fact, we guarantee, if your coin passes the diameter, thickness and weight tests, but you still feel it is a fake, simply send us the suspect coin and we will pay you the spot gold price for it! This is an amazing offer given that gold coins might be counterfeited by plating tungsten with gold then passing these coins off as real, but this form of counterfeiting has never been done… yet. Tungsten is an extremely hard and brittle metal, it would be at best, difficult to stamp a coin with a tungsten inter core without breaking the coin*. The disturbing fact is that there are some gold plated tungsten bars running around New York. These 10 oz bars are a block of tungsten about an inch thick, plated with gold, stamped with a hallmark then passed off as solid gold. How does that relate to gold coins? Gold coin blanks are made from sheets of near pure gold then stamped out with a ten ton press. Stamping a blank coin with tungsten would be almost impossible. The ten ton stamping machine required to imprint the surface images in all likelihood would shatter the thin tungsten core upon impact. There may be other techniques for counterfeiting coins. A mixture of gold, tungsten and copper could create a fake Krugerrand that would then be plated and stamped to make a coin to look correct and pass the Gold Coin Balance test. The main drawback to this approach is the final cost of manufacturing, which may be greater than the net cost. The effort would not be a profitable option. There are other metals that have been tried, but they do not have the correct three characteristics that makes them gold… gold is gold and nothing else! In addition to the Gold Coin Balance, there are other testers such as density and x-ray machines to identified the fake bars and coins. These units are costly and difficult to manage. The Gold Coin Balance retails for about $20.00 and could not be simpler to use. We however working on another testing method called the “ping test”. This is similar to what you see in the movies; a coin is tossed on the table and has the true “ring of gold”. This new design listens for that ring through a meter that registers the specific sound of gold. If the bad guys ever do come up with fake gold coins we at Gold Coin Balance will be ready with an alternative. This “ping test” unit should retail for around $100. So before you invest in a gold coin, be sure to invest in a Gold Coin Balance. If you want to see how it works watch our video. Goldcoinbalance.com has discovered a fake gold eagle one oz that passes the tests for weight, size and thickness. Henceforth, we can no longer guarantee Eagles or Kruggerrands that pass the three Gold Coin Balance tests. 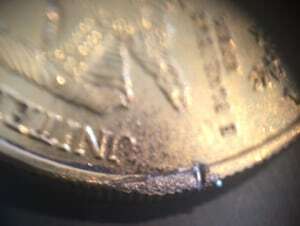 Here is a photo of the fake coin, we have filed the edge to expose the core of Tungsten. If you look closely at this photo there was a slight bubble and color is off. The ring test also is a giveaway. Someone is using a Tungsten core to create the fake American Gold Eagles. What does this mean? That someone is trying to destroy the gold coin market and hence gold? Now that I have exposed the fakes, the cat is out of the bag and we will soon provide a tester to catch these fakes. In the mean time please look at 99.9% gold one oz coins. We continue to buy any thought to be fakes that are in this category.